Julie Eddy has been working with ISO9000 for 19 years. She knows Quality Assurance. She now works for Miller, a five generation family-owned company founded in 1899. In 1981, they started manufacturing Miller Pro forage boxes, and then added self-propelled sprayers, which are the heart of their product lines now. They operate in one physical location – in St Nazianz, Wis.! It’s a 780 person town – and the factory is half the physical area. It’s a very, very family oriented environment. Her daughter loved driving one of the sprayers on bring your child to work day. They’ve been users of IFS since 2001, and upgraded to IFS Applications 8 in the summer of 2013. In 2011 they rolled out iPads to their manufacturing floor. It was mainly used on the assembly line. That started down them down the mobility path. None of the iPads have broken, and it’s added to their efficiency. The Quality department plays a role in Lean – specifically in the waste area. The staff creates the Nonconformance Report (NCR) on nonconforming products. On any day there are about 15 NCRs across the company’s huge number of parts numbers. The company had 193 employees in 2010. By 2012 that had grown to 273, but the quality team only increased from five to six, despite the massively increased production. They were working lots of overtime, as it was all they could do to keep up. In 2012, they had a very heavy focus on supplier improvements. In 2013, they implemented a Supplier Corrective Action System to free up their own quality resources. Still, too much of their time is spent on managing noncomformance. They used an Access database to track nonconformances. The form has exactly the information they need. They can e-mail records by part number, department and supplier. It’s quick and easy to use. However, it can become unstable at large database sizes. At minimum, they had to archive data once a year. None of the fields are linked to IFS, so they wound up spending a lot of time copying and pasting. Supplier reporting calculations required a manual operation because the data involved is in two different systems. And they have 500 different suppliers to do this for. One of her daughters ended up discovering nonconforming items on the shelf that were six to eight months old, and unprocessed. The system didn’t allow tracking of items once they did leave the business – or if they ever got the credit back. And due to their physical size, these parts are difficult to inspect. A typical inspection may require a forklift truck. 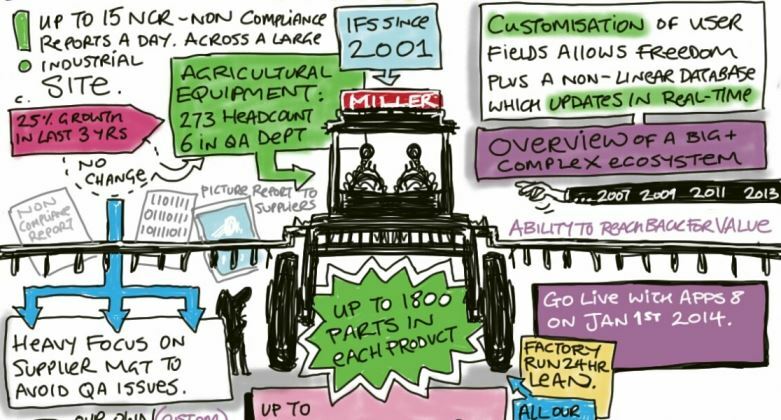 The current process requires multiple trips across a very large area, just to gather all the information for inputting back at the desk.It was ripe for improvement – could the IFS module do that now? Julie was not willing to accept any functionality givebacks in an upgrade or reconfiguration of IFS Applications. She wants her staff to travel less around the plant. Manual tracking needed to be eliminated, and the database needed to be stable regardless of size – allowing multi-year reports. The top priority was to create different supplier reports simultaneously. The NCR functionality in IFS Applications 8 had most of what she needed. There were four critical missing fields, and a number of unneeded ones. She thought that was a show-stopper. However, IFS 8 allows user-defined fields, so their IFS specialist, T.J. Hendrikse, was able to add those, and hide the unnecessary ones, all without modifying the source code. The other priority was to eliminate travel time between where the NCR data is collected and where it is introduced into IFS Applications. The solution? A Microsoft Surface Pro that the team can use. They can build the report, including photos, using the device. Manual tracking was the next challenge. The workflow solution in the NCR flags required tasks via e-mail, and tracks completion. They get an overview of the status of all of the parts. That’s manual tracking gone. There are no longer limits on the size of the database, allowing Miller to eliminate annual archiving, and generate multi-year reports. Redundant entries are eliminated because much of the required data is there in the system, so it just needs to be attached to the NCR. The final step was creating a dashboard that generates the supplier reports. The new NCR system is currently a work in process, and they are testing workflows with various departments. They’re hoping to be live on January 1st of 2014.